For most conspicuous bravery and devotion to duty. A bombing party under Lieut. Craig attempted to rush across 40 yards of ground which lay between the British and enemy trenches. Coming under very heavy rifle and machine gun fire the officer and the majority of the party were killed or wounded. Unable to move, Lieut. Craig lay midway between the two lines of trench, the ground being quite open. "In full daylight Pte. Faulds, accompanied by two other men, climbed over the parapet, ran out, picked up the officer, and carried him back, one man being severely wounded in so doing. 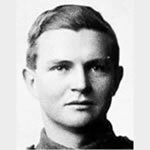 Two days later Private Faulds again showed most conspicuous bravery in going out alone to bring in a wounded man, and carrying him nearly half a mile to a dressing-station, subsequently rejoining his platoon. The artillery fire was at the time so intense that stretcher-bearers and others considered that any attempt to bring in the wounded men meant certain death. This risk Private Faulds faced unflinchingly, and his bravery was crowned with success.